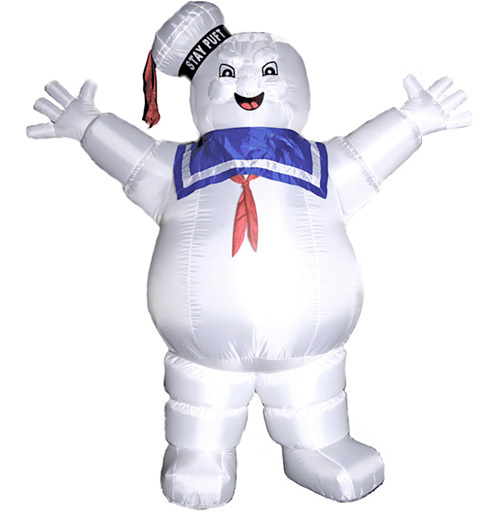 8 1/2 Foot Tall Inflatable Stay Puft Marshmallow Man | OhGizmo! I usually think these kinds of giant, inflatable holiday decorations are just plain lazy. Particularly for Hallowe’en when it’s so easy to create something far spookier for trick-or-treaters. But this time I’m willing to make an exception because this 8 1/2 foot tall inflatable Stay Puft Marshmallow Man from Ghostbusters is all kinds of awesome. He’s available for pre-order from ThingsFromAnotherWorld for $88, which is a little expensive, I know. But, 1) That probably includes the air pump needed to keep him inflated and menacing and 2) It’s an 8 1/2 foot tall Stay Puft Marshmallow Man!! !… I rest my case.